A video report by cars.com shows a couple electric car fast charging scenarios, and how the fees currently charged could negate the lower "fuel cost" advantage of electric cars. Commercial electric vehicle fast charging stations are beginning to be available in the Chicagoland and SF Bay areas, and as predicted earlier the users like the convenience but are not happy with the fees to access the charging stations. The existing stations in the field are owned by 350Green, and require having a "CharJit" card to use the stations. CharJit cards are available from 350Green and cost $21 for 3 charging stations, or $7 per charging session. Each charging session gives 30 minutes of access to a charging station. The company is installing networks in the Chicago area, and the SF Bay Area. The eVgo network in California has not yet been built, but we do know a few things about the fees. In Texas, eVgo charges three levels of monthly fee two of which include access to the eVgo Freedom Stations, for approximately $30/month premium. In California, the agreement with eVgo requires credit-card based access for anybody for those who do not have an eVgo membership, at a cost between $7 and $15 per charging session. 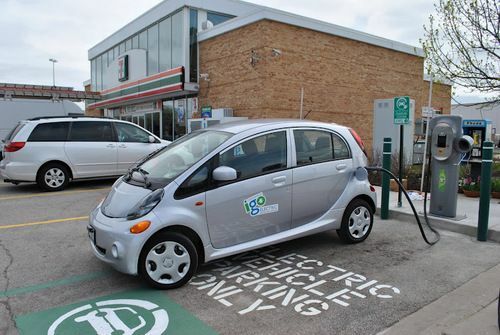 Current laws and electricity regulations prevent a company like 350Green or eVgo from reselling electricity. This means charging station fees are not based on the kilowatt-hours consumed while charging the car. This is unlike the cost of gasoline at the pump, where gasoline station owners buy gasoline at wholesale prices, sells it at a retail price, and pockets the difference. Instead the fee to use a charging station is based on the length of time the car is plugged in. The following video shows two fairly typical charging scenarios and the cost to use a 350Green fast charging station in Chicago. In the first scenario, a Nissan Leaf pulls up with a nearly empty battery pack. After 30 minutes the dashboard gauge showed 79 miles estimated remaining range, and 8 bars out of 12. The claim for fast chargers is "80% recharge within 30 minutes or so", but this scenario showed the car being filled to 67% full (8 bars out of 12) in exactly 30 minutes of charging. The cost: $7, for a full 30 minutes of charging. In the second scenario, a Mitsubishi i-MiEV pulls up with a battery pack at 50%. After 10 minutes the car is at 80% full. Because CharJit consumes a full charging session each time you charge a car, the cost was also $7, for 10 minutes of charging. The first item to discus is that 350Green is charging the customer on 30 minute increments, not by the minute. The Mitsubishi driver only used 10 minutes of the 30 minute session, but was charged for the full 30 minutes of access. Clearly one should make sure their car is depleted enough to warrant a fast recharge. It would be desirable for 350Green to change the fee structure to charge by the minute, as suggested in the video. The next item to discuss is the accuracy of the fuel gauge in the Nissan Leaf. As shown in the video the Leaf dashboard claimed 79 miles estimated remaining range, and 8 bars out of 12, with reviewer Joe﻿ Wiesenfelder calculating the battery pack as being 67% full. Taken at face value it means the fast recharge, in this case, took longer than the 30 minutes it was supposed to take. However there are a couple reasons to doubt the accuracy of this "67% full" calculation, the first of which is that Nissan Leaf owners call the dashboard the "Guess-o-Meter" because it has wildly fluctuating readings. The EPA has rated the Leaf as having a 73 mile range, while Nissan claims it to have a 100 mile range in city driving. This means the 79 miles estimated driving range shown on the dashboard is in the neighborhood of 80% full (or more). Nissan needs to take ownership of improving the reliability of the dashboard. The last item to discuss is something we've gone over before, the cost to use a public charging station compared to gasoline in miles driven for both fuels. On the Nissan Leaf an 80% recharge is roughly 56 miles of range, costing $7. For a gasoline car the $7 buys 1.75 gallons if gasoline is $4 per gallon, and the distance you can drive with that gasoline depends on the fuel efficiency of your car. For a 30 MPG car that is 52.5 miles, but the video below claims a Prius will go 87.5 miles on $7 worth of fuel. You can go farther with a Prius for $7 than you can with an electric car, if the electric car is charged at a 350Green or eVgo fast charging station under current fees. Electric cars are cheaper to drive than gasoline cars, if every time you recharge you're paying just for electricity. This is true because electric cars are more efficient with the on-board energy than are gasoline cars, and electricity has a more stable price than gasoline. However, because the charging station networks are not charging for electricity but access to the charging station, the determination of which is cheaper gets skewed every time an electric car is charged at a public charging station that charges an access fee. Some level 2 public charging stations are free to use, and the charging station owner earning revenue to pay for the station in other ways, such as increased shopping at a store, or in parking fees in a parking lot. The fast charging station fees we've just discussed are well above the cost to charge at a level 2 charging station, and are high enough for parity with the cost of gasoline to drive the same distance. This is unfortunate because the lower cost to drive an electric car is supposed to help in recuperating the higher cost to buy the electric car, but what if public recharging fees are so high to negate that benefit? Why is the fee to access fast charging stations so high? Representatives from 350Green and NRG/eVgo have given these reasons: a) The cost to build one of these stations is very high, as much as $100,000 per station. b) The high electricity demand at a fast charge station means the charging station operators pay what's known as "demand charges" that are charged of any electricity customer that has huge demand spikes at random intervals. c) Land rental or other fees paid back to host sites. These costs may drop in the future, but today they are what they are. In the future fast charging stations could become cheaper, and there is research into ways to avoid the demand charges. One effort, being funded through the settlement agreement with NRG, hopes to develop technology to energy storage systems to store electricity in a large battery pack colocated with the fast charging station. When a car is fast charged, the charging station would draw power from that battery pack rather than the grid, and the battery pack would in turn charge itself at a lower rate that will avoid demand charges. The energy storage battery pack would add to the cost of installing a fast charging station, but it would give the charging station owner an opportunity to earn back-end revenue from making those battery packs available on the grid for grid stabilization services. If you drive a Chevy Volt you don't have to worry about running out of electricity, and you don't need to bother with the pricey charging stations. Charge the Volt when and where it is convenient for YOU. Plus, the Volt is made here in America, not overseas. There is a lot of "slack" in the charging level bars display in the LEAF, 8.3333% worth. He could have been very close to 75% (9 bars out of 12) with only 8 bars lit. Great video. ComED pricing for electricity is normally flat rate and if you did it at home charging 80% of a Leaf would cost about $2.50 or less (I think significantly less for just the electricity). This Quick Charge (level 3) cost $7 and didn't look like they even got the 80% fill. So these guys are charging you a $200% margin to use these quick chargers - who wants to bend over for that? This will ensure these will only be used in emergencies by EV's (if the consumer has no other choice which the drivers will avoid like the plague) while plug-ins with engines (like the Volt or Prius Plug-In can just smile as they drive over to the gas station and fill up for less money). These guys should charge you $1 on top of the electricity to use these things and they'd be used, not $5 as they'll just be active museum pieces.